Since Hendersonville, Tennessee has temperatures that range from less than 0° to more than 110° and you generally can't trust a Tennessee weatherman your cars coolling system needs to operate properly in any weather. You need to be ready for this wide range of temperatures so we need to keep our customers cooling systems in very good condition here in Hendersonville. Even small failures in the cooling system can create a very large repair jobs for the engine. Something as simple as not mixing the coolant ratio correctly can cause the engine block or the radiator to freeze and crack, (that's not very good). Cooling systems that don’t work correctly can also cause the heating system of the car not to work correctly because the heater core doesn't get hot enough. In the winter time here in Sumner County, Tennessee customers notice problems with their heaters VERY quickly and they are never happy about it. Early cars used radiators with a hose on the top and a hose on the bottom and had coolant flow from the bottom to the top through gravity. This system was flawed because the coolant had a tendency to flow in a straight path down the radiator and not use the whole radiator. You could feel "hot spots" in the passages of the radiator between the inlet and outlet passages of the radiator. ( All engineering starts somewhere and the first design is rarely the best design). As cars became more sophisticated and engineering got better radiators started flowing the coolant sideways across the radiator in an effort to make the coolant flow more evenly like the one on the left shown here. 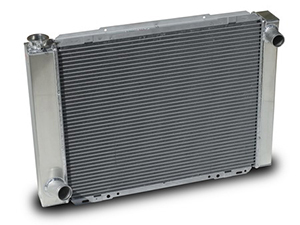 The technicians here at Hendersonville Muffler Company have the experience and the equipment to repair any vehicles cooling system.